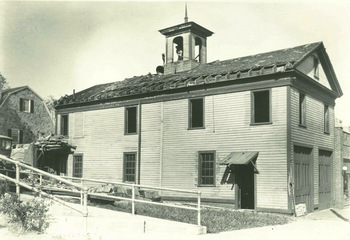 The first central fire station was built in 1845 on the current site of 24 North Pleasant Street. On the south side of the station house was a livery stable; to the north, a blacksmith shop, and later Kiely’s garage. The building was a single story wood frame, with a two-story brick addition to the rear which housed the lockup for the police department. There appears to have been room to house only a hand pumper and a “hook and ladder” truck. By 1896, the Fire Department Board of Engineers was eager for additional space. By 1898 firemen were able to live in the fire station, an arrangement which began the permanent firefighting force. Given the long history in Amherst of spectacular downtown block fires, for quick response the new station could not be far removed from the one it was replacing. The town purchased the old homestead of the Whipple family, just north of Kiely’s garage, and demolished it. (A leaded glass window from the upper story of the building was set aside and used later in the addition and renovation of the Jones Library in the 1990s.) 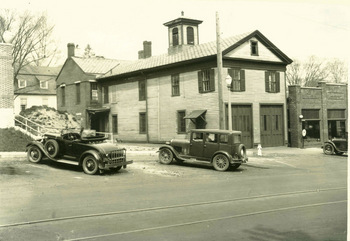 The new Central Fire Station construction began in 1929 and was completed in 1930 at a cost of $45,000. The 72-year old Central Fire Station of today has undergone a number of additions and renovations. Contrary to belief, horses were never housed in the station; by the 1930s, the Department was using motorized fire apparatus. A one-story addition to the rear of the building, originally added as garage space, has since been turned into offices and storage space. At least three different rooms in the station were once used as the Dispatch Center, where emergency calls by phone and street call box were received. This responsibility was assigned to civilian dispatchers in the 1970s. (The Amherst Communication Center is now located on the third floor of the Amherst Police Station at 111 Main Street.) In the early 1970s, twin fire poles that led from the upstairs locker room to the apparatus floor were removed as a safety concern. A 562-pound bell, which sits on display at the front of the building, had at one time sounded the alarm from the cupola of the old Central Station. It was placed into service in June of 1888, having been purchased by Chief Engineer William Henry Harrison Morgan at a cost of $136.19. A Civil Defense siren of World War II vintage still sits atop the station, now all but abandoned. Longtime town residents may remember the days of their youth when a fire horn would sound out a three-digit code of blasts to announce the street location of a fire alarm coming in by street box. Many a wide-eyed child would run to the kitchen cabinet where the family kept the list of fire codes published each year by the local newspaper. If he or she was lucky, the family might even bundle up to visit the scene of the conflagration and watch their fire department in action. Text originally published on the Fire Department, Town of Amherst website.